The chip sector has been weak and sending out warnings since early September, and now that earnings are rolling out, investors are watching to see if their weakness spells trouble ahead for the broader market. The sector has a unique window into the global economy and can be an early warning in slowdowns in a range of industries, from autos to aerospace, PCs and cellphones. "When they're cutting back orders hard going into the holiday season, which is when most of the companies have huge sales, ... that gives you a pretty powerful sign that there's probably something going on," said one investor. When the chips are down, it sometimes spells trouble for the broader market, and that's what's worrying some investors this week. Several semiconductor companies are stumbling over their own problems, but collectively the sector's sloppy performance and increasingly cautious outlooks are ringing warning bells for technology and the broader stock market. Advanced Micro Devices was among the biggest casualties, down 15 percent on Thursday alone. The VanEck Vectors Semiconductor ETF, lost 6.7 percent on Wednesday, its worst decline since the financial crisis in November, 2008. Even after a bounce on Thursday, the chip ETF was down 14 percent for October heading into Friday's trading. 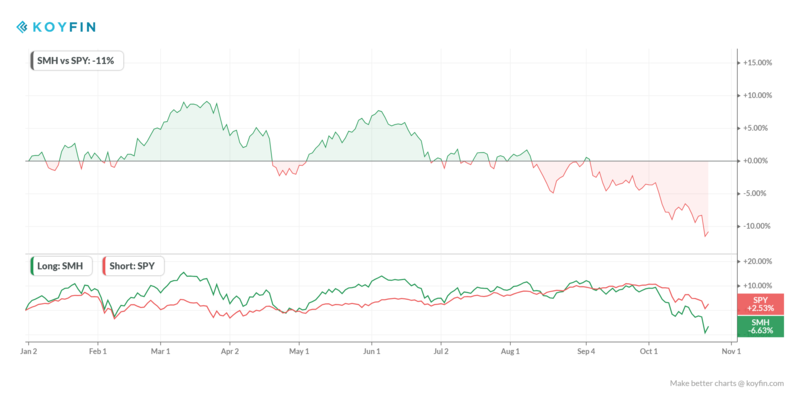 But the chip sector started to roll over versus the S&P 500 in September even as the broader market went on to hit another record later that month. Texas Instrument's cautious warning set the tone earlier in the week, and that raised concerns across the market about the outlook for earnings in the fourth quarter and next year. Intel reported better-than-expected earnings Thursday afternoon and raised its outlook for the year, but it was set to open just slightly higher on Friday. "Semiconductors fall into pretty much every industry," said Dan Niles, founding partner of AlphaOne Capital Partners. He said warnings from semiconductor names are not new, but Texas Instrument's comments had more of an impact when it warned about a slowing in all its end markets, which includes autos and aerospace. "You can look at a company like Texas Instruments and they were sounding great on the conference circuit until mid-September. This was the first time they missed on revenues since the December quarter of 2015," said Niles. "When they're cutting back orders hard going into the holiday season, which is when most of the companies have huge sales, ... that gives you a pretty powerful sign that there's probably something going on." AMD's problems were in part due to expectations that it would continue to see strong revenue growth from cryptocurrency miners while others in the business did not. It also was a stock that had continued to climb while others fell hard. During the summer, chip stocks were hit by concerns about memory pricing and then later, DRAM pricing. "I think they're signaling something that's broader and indicative of, I think risks that could exist as we go through the fourth quarter and right into the first quarter," said B. Riley FBR analyst Craig Ellis. "This supply chain is in the process of responding to concerns about what happens if trade frictions between the U.S. and China broaden, and there's a reflexive reaction to reduce orders into that, and inventories." Ellis said he expects to hear more comments like those made by Texas Instruments, as more companies report. Texas Instrument's message reverberated the most through the broader market, feeding fears that slowing Chinese growth and trade wars will bite into earnings growth in the fourth quarter and next year. "I think they've played into investor's worse fears," said Lori Calvasina, chief U.S. equity strategist at RBC. "I think the tone around demand has been poor for some of them. I think investors are very skittish. I think most companies have come out and said the underlying economic backdrop and demand is fine, but there have been a number of examples that have spooked investors, and semis are on that short list." The hit on AMD also was a kick to a stock that has outperformed. "Semis have been weak and AMD and NVIDIA were two stocks that had been holding up pretty well. They're the last two to go," said Paul Hickey, co-founder of Bespoke. "The whole semi weakness is pretty well documented at this point. Some of the pressure is being relieved on the sector, but it's not necessarily going to bounce back from here. It would be good to see that sector show stabilization."